Up at 5:11, snoozed the alarm twice, but still managed to be packed by 6 am. I notice that there is enough light to have been rolling by 5:40, so I'm still not operating as efficiently as possible. Eat breakfast at 6:10, and am rolling by 6:25. The hotel manager has given me directions out of town. The detour is well-marked, and the manager was right about the hills-I complete a series of pretty-long 7% and 8% climbs and drops. I'm pleased with the regularity of signage indicating that I'm headed toward Amman, the large city I will be touching the edge of on my way to Madaba. I've been riding hard, mostly in my lowest gears, for two hours and my left knee is acting up for the first time since the start of the trip. At perhaps 8:55 am, after enjoying a nice descent, I stop for a soda. Just to be safe, I point in the direction I'm headed and confirm "Amman?" The clerk points back the direction I've just come from. Jeez! That means the guy, two minutes ago, who had pointed back behind me when I had asked "Amman?" wasn't yanking my chain. The soda guy's saying I need to go back the direction I came from about 6 kilometers. Back up the hill. I'm pissed! How could I have been so happy with the signage, yet still missed a turn. Riding back in the other direction, I do see signage indicating Amman and Madaba pointing back up the hill, where I came from. Oh, well, I get to add a 12 k mistake to today's distance. Ten minutes later I fact-check at some sort of auto dealer and end up spending 15 minutes over coffee. It's an interesting stop. The main guy tells me he's Christian, likes George Bush, but is down on Palestinians and somewhat down on Israel. He points two others in the room as Palestinian and pro-Hamas. Moving on, I continue my climb out of town. I'm not sure how it works out that I don't end up back in Jerash, but somehow I'm on a different road than before, and the signage is now indicating the airport, which is great, since that has me heading to the south of Amman. 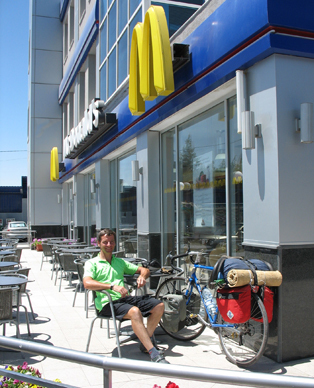 Jeez, there is McDonald's! Although it's a little early for lunch, I do a 10:45 am to 11:15 stop, super-sizing my fish fillet meal. At around 12:30 I pull over under an awning that's keeping a police car out of the sun. The signage just ahead indicates that this is the turnoff for Madaba but I'm feeling pumped, and am tempted to push on instead to Karak. Reality intercedes. My map shows that it is 83 k on the freeway, plus 33 k side road to get to Karak. Madaba, directly meanwhile, is about 26 k.
I enjoy my time with the police, showing them warnings about rock-throwing kids in the Lonely Planet guidebook (one can read English quite well!) and getting their advise on the next leg: Madaba to Karak. Hmmm… "Don't use the King's Highway," is their opinion. "Bicycle back out here, to the freeway, then ride south, and cut back in." I'd made only a few scribbles on my map before leaving the US, and one of them is "Steep. Dolmus." on the Madaba stretch. I had decided before starting that this was a stretch that I should skip, and the police seemed to be supporting that position. I take the offramp to Madaba, and am soon at the outskirts. In Madaba I quickly get directions to a traffic circle that has some of the Lonely Planet-recommended hotels close by, but I shoot down the side road to find the cheapest recommended hotel, the Madaba Hotel. I do note that this town has the most prolific hotel signage so far. At the Madaba I take a no-bathroom room for 7JD and breakfast for 1JD extra. I time-check - it's 1:30 in the afternoon. A beer at the LP-referenced Ayola Coffee Shop costs 3JD, which annoys me a bit. Off to do some sites. Across the street, in the floor of St. George's church, is the famous mosaic map of Palestine and part of Egypt, completed in the 6th century. It's nice enough, but I lose interest in scurrying to the other, clearly lesser mosaic excavations. So I take a spot on an empty pew, put in my ear phones, and enjoy both the stillness of the empty church, and the frenetic energy as busloads of tourists rush-in every 20 minutes or so. Don't take the Dead Sea route - very hot. Don't take the main highway - it's very busy. Take the King's Highway, but be aware that you will be crossing two large wadis (valleys). 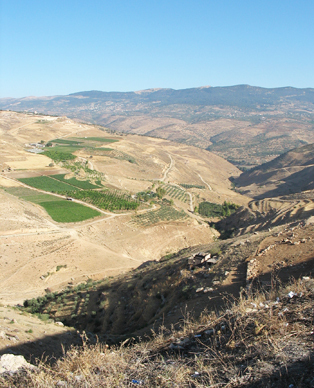 Early in the ride I will come to about 6 k of dips and climbs, similar to the stretch south of Jerash. He said I should be in Dhiban in less than 2 hours. Immediately after Dhiban is Wadi Mujib, a 10 k downhill and a 10 k climb to get back out. But after that the ride will be quite flat. The manager is at the front counter, and I request breakfast be available at 5:30 am. 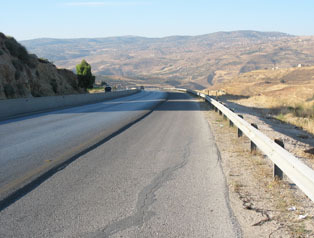 The route toward Amman was hilly.. The McDonalds was a surprise. I don't eat there back home, but here, it was a pleasant novelty. 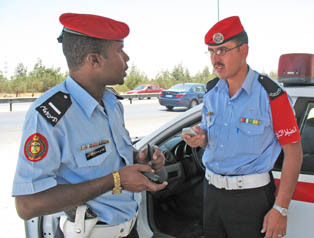 I stopped to chat with some traffic police. 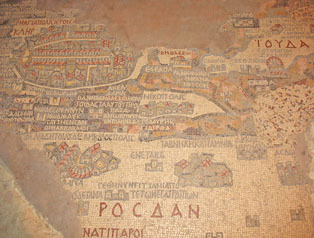 Madaba's great claim is the remainder of a 6th century map of Palestine.